Egyptian institutions receive complaints from local people, claiming that stray dogs are aggressive and dangerous dogs. Unfortunately, the government acts accordingly to these complaints… the Veterinary Service Department in Egypt is responsible for the killing of countless numbers of stray animals. Poisoning with strychnine (an alkaloid that can be fatal to humans and other animals and poses also highly toxic environmental risks) is a common method of free roaming cats and dogs murder, but in some areas of the country shooting is a common practice too. Fortunately, stray cats and dogs are lovely and tenaciously protected by many animal welfare associations against the abuses perpetrated by Egyptian authorities that, without further ado, should engage in the planning and implementation of humane dog population control programs. Some NGOs are implementing successful Trap/Neuter/Vaccinate/Release programs and some activist have contacted the government to discuss humane dog population control methods. …but there is also good news!!! The Parliament member confirmed that she is in the process of preparing a resolution draft that will include all aspects of animal protection, including cattle (livestock), in compliance with the Egyptian constitution. 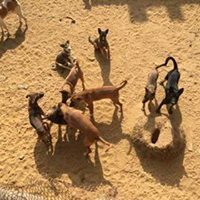 Egyptian animal welfare associations are actually discussing with the government to find more human ways to control the number of stray animals in the country and trying to press on adopting the animal protection law. If passed, this law would solve many problems: the Government itself would be frightened to do anything against it and would have to contract the TVNR as the only humane solution. OIPA thanks its member league “Touch of Life Organization” that provided us with important information. The association has a big shelter hosting a large number of animals, mainly cats and dogs. Due to scarce financial resources, Touch of Life cannot carry out massive TVNR projects but does its best to spay, neuter and vaccinate the largest possible number of rescued animals. The association is also involved in awareness campaigns aimed at teaching children and adults as well about animal rights.